The dream come true silk and rich wash for curly hair, made with the finest natural & organic ingredients to breath life into wave, curly, and coily strands. It gently cleanses without stripping beneficial oils, and infuses maximum hydration with added essential nutrients and amino & fatty acids. This luxurious natural wash formulation increases strength, shine, softness and curl formation resulting in beautiful, easy to manage smooth curls. PhytoBlend Proprietary Concentrate dramatically restores & revives your curls’ texture and appearance. Almond Oil’s moisture-sealing properties for vibrant shiny locks and breakage prevention. Sunﬂower Oil moisturizes hair and scalp, promotes hair growth and provides UV protection. To use: Massage into thoroughly saturated wet hair and scalp. For more lather, repeat with a small amount of wash on the 2nd pass. 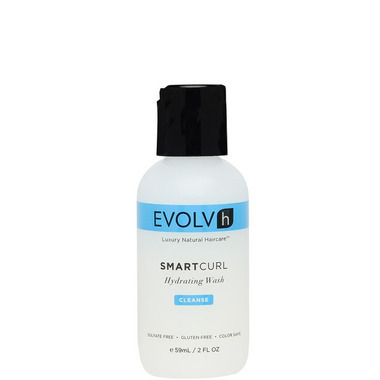 Follow with SmartCurl Hydrating Conditioner. Ingredients: Water, pHytoBlend (proprietary concentrate blend of 20 herbs in an aqueous base ), Decyl Glucose, Disodium Sulfosuccinate, Cocamidopropyl Betaine, Lauryl Glucose, Coco Polyglucose, Kiwi Seed Oil, Almond Oil, Seaweed Extract, Citrus Aurantifolia, Mango, Lecithin, Sunflower Oil, Soya, Safflower Oil, Soy Amino Acids, Vitamin , Wild Pansy, Sweet Clover, Apricot, Nasturtium, Nectarine, Passion Flower, SmartScent™, Citrus Seed Extract.